We Serve the Business Sector, Farmers, Ranchers and the Professional Contractor / Erector or those that want to build it themselves We are also a General Contractor and erector, so if you need a turnkey project, you’ve come to the right place. We supply Metal Buildings for Industrial, Residential, Commercial, Oil Field, Retail, General Aviation, Government, Energy, Agriculture, Public and Private Utilities all in strict accordance with the AISC and your specifications. Image Building Systems routinely designs agricultural and livestock facilities that include light transmitting panels and lofts for added storage space. Large, clear span interiors provide uninterrupted floor space that could include cubicles, or stalls with brisket boards and neck rails. Floors could be concrete, concrete screed, or hard or soft rubber mat with a waterproof surface to prevent saturation of bacteria. Our pre-engineered steel buildings can be customized to fit your needs with a myriad of design features. Recessed spaces in the aisles for water faucets, an easy-to-clean wall finish, maximum roof lighting, and the inclusion of a high pressure wash down system are key features that Image Building Systems can accommodate. Our design approach allows high ceilings that help promote proper ventilation to clear the air of dust and mold in bedding, hay, and feed. 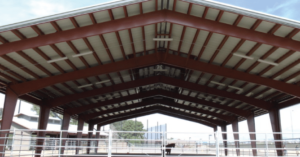 Each one of our pre-engineered steel buildings are individually engineered and designed to meet all requirements, as well as local building codes. Future maintenance and energy cost considerations receive major attention. Performance-proved quality materials used in the manufacturing process ensure savings on future upkeep and maintenance costs. And, when it’s time to expand, Image Building Systems can provide the answers. 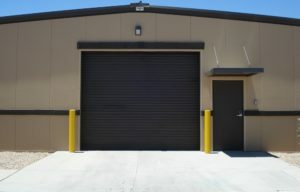 Our pre-fabricated metal buildings give the flexibility to add on in an easy, economical, and attractive way. So, when it comes to designing your new livestock facility, call Image Building Systems at 602-216-3706. Our pre-engineered metal building system provides design flexibility, as well as energy efficiency and lower maintenance costs. Your dealership can be designed with high ceilings or column-free interiors providing wide, clear floor space for maximum showroom and shop requirements. Each pre-engineered metal building is individually engineered and designed to meet all requirements, as well as local building codes. With careful planning, your pre-engineered metal building will be as functional as you need it to be. This planning allows for easy and economical expansion. They are extremely energy-efficient, and save on future upkeep and maintenance costs. 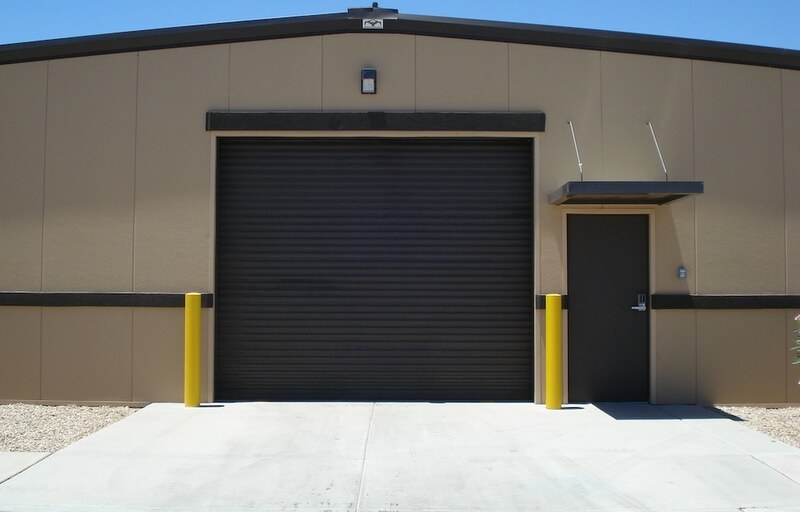 Our pre-engineered metal buildings have unparalleled advantages, such as faster construction time and low maintenance, as well as design flexibility. Your metal hanger building can be designed to meet your exact specifications, to house your particular aircraft. Column-free interiors provide wide floor space, and high eave heights accommodate even the largest airplanes. And, our buildings can accommodate bottom rolling, bi-parting doors, bi-fold doors and stack leaf door arrangements. Each pre-engineered steel building is individually engineered and designed to meet all requirements, as well as local building codes. Our metal buildings blend with any conventional exterior. A mixture of precast concrete, glass, brick, stone and other veneers will accent your building’s beauty and compliment the surrounding environment. When it comes to building a new aviation building, call Image Building Systems at 602-216-3706. Our pre-engineered metal buildings have unparalleled advantages, such as faster construction time and low maintenance, as well as design interest and an assortment of exterior veneers that make them an ideal solution for the developer. Our pre-engineered metal building systems can be completely customized structural systems that allow us to work with you to provide a building to your exact specifications. By using our computer designed, pre-engineered components, you can save up to 50 percent over ordinary construction methods. This flexible system accepts a variety of finishing material such as pre-cast concrete, glass, stucco and preassembled brick walls that will meet zoning requirements, accent your building’s beauty and will enhance the immediate surroundings. Additionally, our energy efficient pre-engineered metal buildings reduce heating and cooling costs and save on future upkeep and maintenance costs. When it comes to designing your new commercial center, call Image Building Systems at 602-216-3706. These structures are a necessity in Arizona and often very cost effective. Commercial covered parking structures are useful for many different applications including office, retail, industrial, and multi-family housing. Our structures are available in Semi-Cantilever, Full-Cantilever and T-Frame designs. If you are located within Arizona, Image Building Systems will provide you with a complete turnkey proposal. We engineer, provide and install these structures. Need a foundation? No problem. We provide you with stamped engineered plans by a licensed engineer. Our structures are designed to meet or exceed local and regional building code requirements. Let Image Building Systems show you! Call us today at (602) 216-3706. Column-free interiors provide uninterrupted floor space which could be dirt, gravel, asphalt, concrete, brick, or rubber brick that is commonly seen in walking rings or saddling paddocks at racetracks. 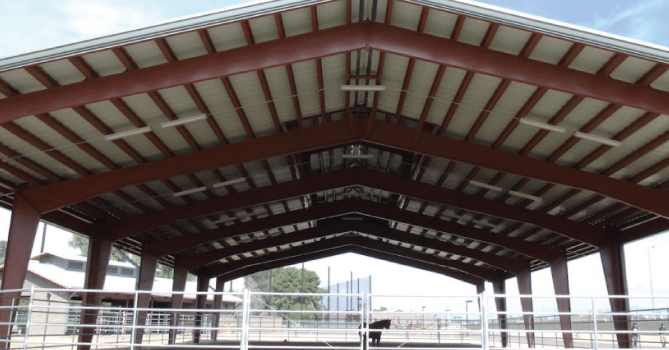 Image Building Systems design approach allows high ceilings that help promote proper ventilation to clear the air of dust and mold in bedding, hay, and feed. Cupolas and dormers can be added to open the facility up to more natural light and help create a stylish grace to the structure. 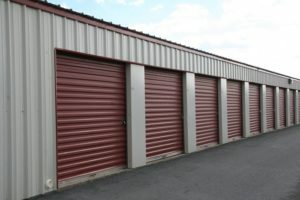 Our pre-engineered metal buildings also save on upkeep and maintenance because of the quality materials and high standards used in manufacturing. So when it comes to designing your new equestrian facility, call Image Building Systems at 602-216-3706. Our pre-engineered metal building design capabilities include large clear spans providing wide open spaces to accommodate your production line and processing equipment. We routinely create industrial steel buildings with overhead crane systems, storage mezzanines and concentrated loads. Your pre-engineered metal building system can be completely customized by you. The variations available with our structural systems provide countless building possibilities that will fit your exact specifications. All of our pre-engineered metal buildings are individually engineered and designed to meet all requirements, including all local building codes. Our pre-engineered metal building systems blend with any conventional exterior. A mixture of glass, brick, stone and other veneers will accent your building’s beauty and will compliment the surrounding environment. IBS buildings can be energy-efficient, and save on future upkeep and maintenance costs. When it comes to building a new community center, fire station, police station, detention facility, school or otherwise, call Image Building Systems at 602-216-3706. Pre-engineered metal buildings allow manufacturing plants to function economically and efficiently. Computer design systems create unique buildings that adhere to manufacturing needs and specific qualifications, including material handling centers. All other construction materials, such as gutters, downspouts, windows, insulation and more! The people of Image Building Systems serve a diverse array of customers across the United States. With well over a million square feet of manufacturing facilities, we are able to facilitate deliveries to virtually any location with uncommon speed and efficiency. In addition, all of our products undergo rigorous testing to certify quality and accuracy. We uphold the integrity of our offerings with several industry leading warranty programs, some of which extend up to 20 years. Image Building Systems is a distributor for Star Buildings, a company of NCI Building Systems, one of the largest integrated manufacturers of metal building solutions in North America. That means when you partner with us, you gain instant access to our broad range of businesses and offerings. Whether you need doors by DBCI, components by MBCI or end-to-end complex building management by the NCI Special Services Group, our family of companies is ready, waiting and eager to serve you. Whether it’s storage, a fire station, maintenance facility, public recreation, or office space you seek, our buildings are just as diverse as the people’s needs you serve. In our pre-fabricated metal building system, each building is individually engineered and designed to meet all requirements, as well as local building codes. These principles give the future maintenance and energy cost considerations major attention which is an important benefit for taxpayers. It not only saves on heating and cooling costs, but performance proved quality materials used in the manufacturing process insures savings on future upkeep and maintenance costs. When your municipality is growing, Image Building Systems can provide the answers. We give the flexibility to add on and build up in an easy, economical and attractive way. Whatever the individual requirement, our pre-fabricated metal buildings can be designed to meet your needs. When it comes to building new public facilities, call Image Building Systems at 602-216-3706. Pre-engineered metal buildings can be completely customized to fit the needs of any type of recreational facility, from a community center that focuses on classes to sports training facilities. These buildings can also be customized with different design features, specialized rooms and outdoor areas. Our pre-engineered metal building systems have a simplicity about them that makes it ideal for shopping centers and free standing retail units. Our computer designed systems can shorten construction time considerably. This flexible system accepts a variety of finishing materials like pre-cast concrete, timber, stucco, and pre-assembled brick walls for striking, code approved architectural effects. Our pre-engineered metal building systems can be completely customized by you. Our numerous structural systems provide countless design possibilities. Your shopping center can be designed with column-free interiors for showrooms and display areas. Column-free interiors provide high ceilings and uninterrupted floor space to fit your exact requirements…all the open space needed, and as high as it’s needed. Or, if required, interior columns can be located in walls separating the respective shopping areas. the performance proven quality materials used in the manufacturing process. So whether your new building plans are in the “dream” stage or tightened down to immediate start-up, contact Image Building Systems at 602-216-3706. Lower initial costs are enhanced by lower operating costs, faster construction, energy efficiency, lower maintenance cost and design flexibility. The perfect thing about Image Building Systems is that while you might want a basic building, you can also have a specially engineered structure to fit your exact specifications. Our column-free, pre-fabricated metal buildings are flexible and expandable. They provide free space for high ceilings and wide floor space for maximum seating requirements. The structure allows for easy and economical expansion. Our pre-fabricated metal building systems blend with any conventional exterior. A mixture of glass, brick, stone, and other veneers will accent your building’s beauty and will compliment the atmosphere already created by your congregation. With careful planning your pre-fabricated metal building will be as functional as you need it to be. You can install ceiling and carpets before modular partitions are added. Specially designed floor and ceiling mounts can give versatility when it comes to rearranging the floor plan. Our energy efficient pre-fabricated metal buildings reduce heating and cooling costs and save on future upkeep and maintenance costs.